???Humiliation??? and ???meltdown??? 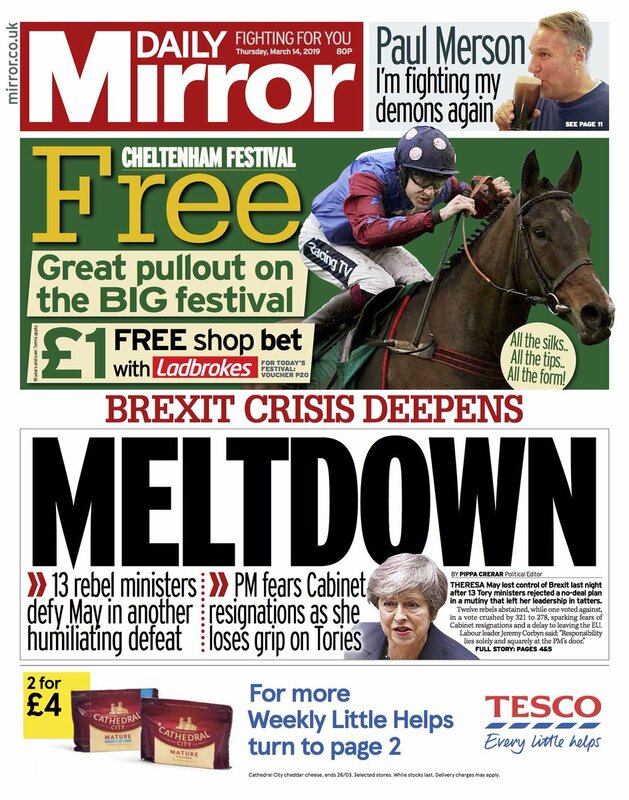 are two words that are repeated across many of the front pages after another bruising day for Theresa May, in which key cabinet members defied the party whip and the prime minister suffered further defeats. The Daily Mail keeps things succinct: ?? ?Chaos reigns?? ?, and says: ?? ?May loses control after ministers??? 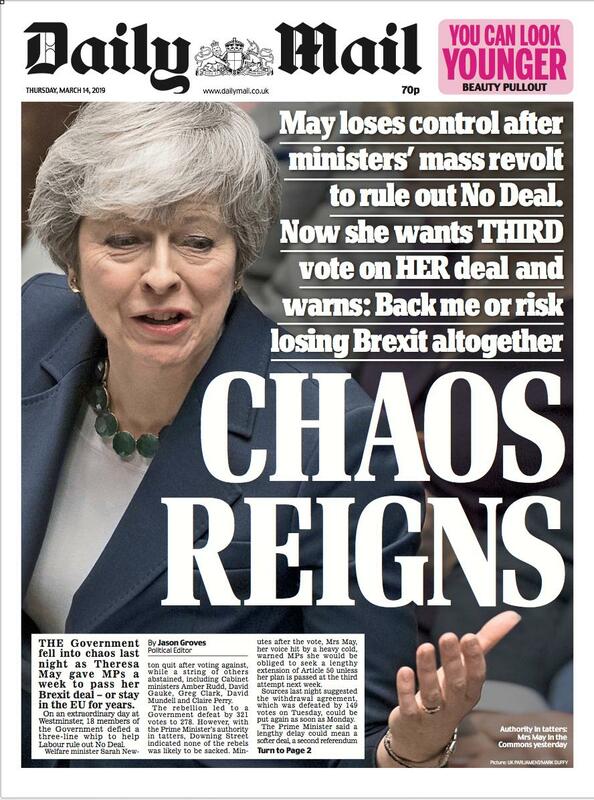 mass revolt to rule out No Deal. Now she wants THIRD vote on HER deal and warns: Back me or risk losing Brexit altogether.??? The Guardian also focuses on where May might take things after this week, with the headline: ???May?? 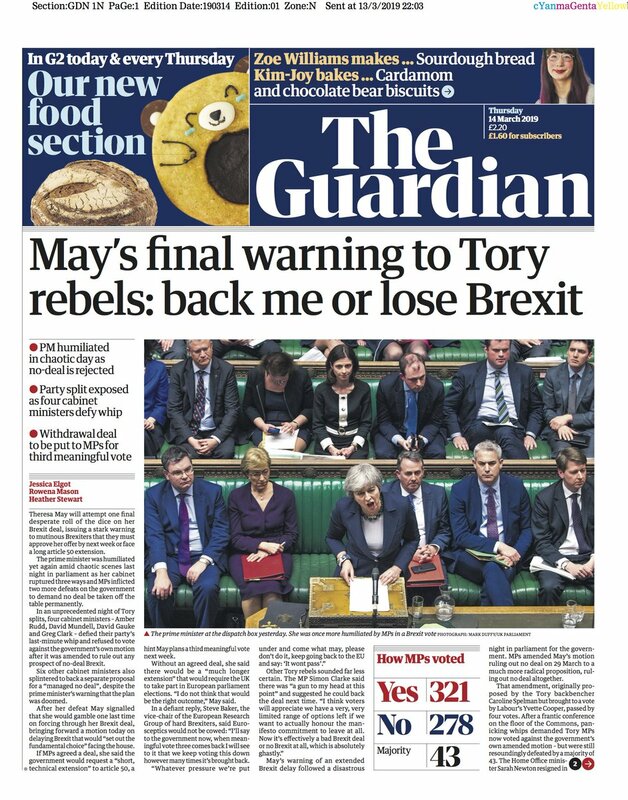 ?s final warning to Tory rebels: back me or lose Brexit???. The paper says the ???humiliated??? PM will ?? ?attempt one final desperate roll of the dice on her Brexit deal??? after ?? ?an unprecedented night of Tory splits??? in which ?? ?as her cabinet ruptured three ways???. The Financial Times has: ?? ?May forced to issue ultimatum after Commons vote rules out no-deal Brexit?? ?, saying that ?? ?after yet another humiliation at Westminster, the prime minister told MPs to back an exit deal within a week or Britain would be forced to seek a lengthy delay to Brexit and hold elections to the European parliament???. The Daily Telegraph?? ?s splash is: ?? ?Brexit delayed until further notice after gang of four rebels???. 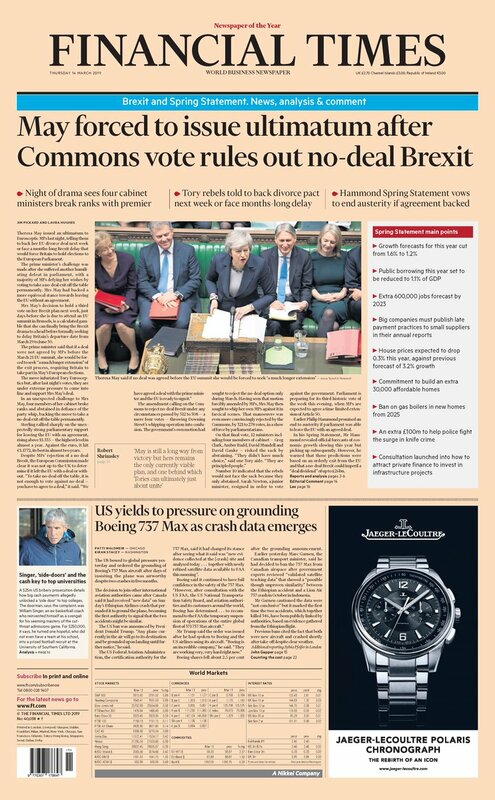 The paper belies its strong feelings about Brexit and those who voted in favour of taking a no-deal option off the table, saying the four cabinet members ?? ?betrayed Theresa May by helping to kill no deal for good???. ???Meltdown,??? says the Mirror, which details how ?? ?Theresa May lost control of Brexit last night after 13 Tory ministers rejected a no-deal plan in a mutiny that left her leadership in tatters???. The i had the same headline, observing that the day?? ?s events represented a ?? ?total collapse of discipline in Conservative Party?? ?, reporting that ?? ?Senior Tories warn that Government edging close to breakdown???. The Times continues the theme with ?? 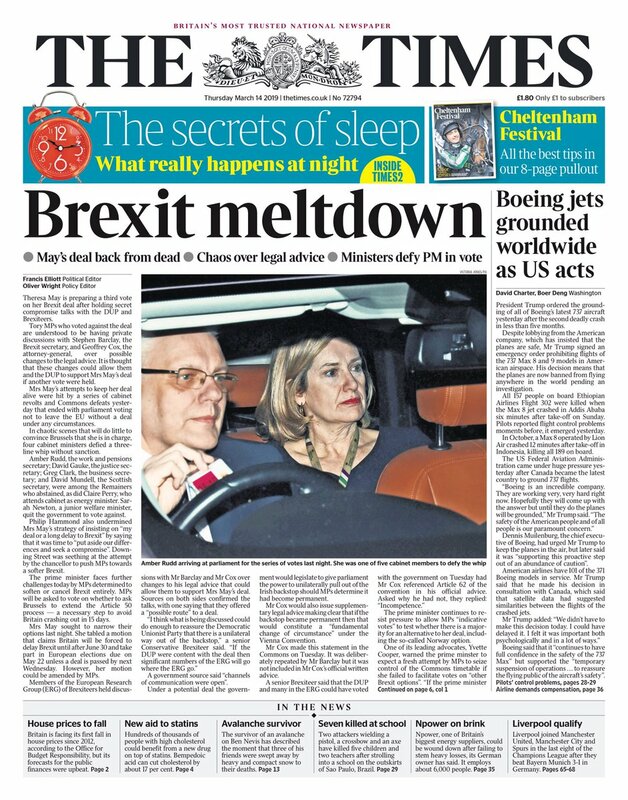 ?Brexit meltdown??? and has Amber Rudd pictured on its front page. The paper also takes aim at Philip Hammond, whom it says ?? ?undermined Mrs May?? ?s strategy of insisting on ?? ?any deal or a long delay to Brexit??? by saying that it was time to ?? ?put aside our differences and seek a compromise???.??? While the adjective used most commonly on today?? ?s front pages to describe the PM is ???humiliated?? ?, the Express have taken a different tack and instead describe her as ???defiant???. The paper?? ?s headline is ???Don?? 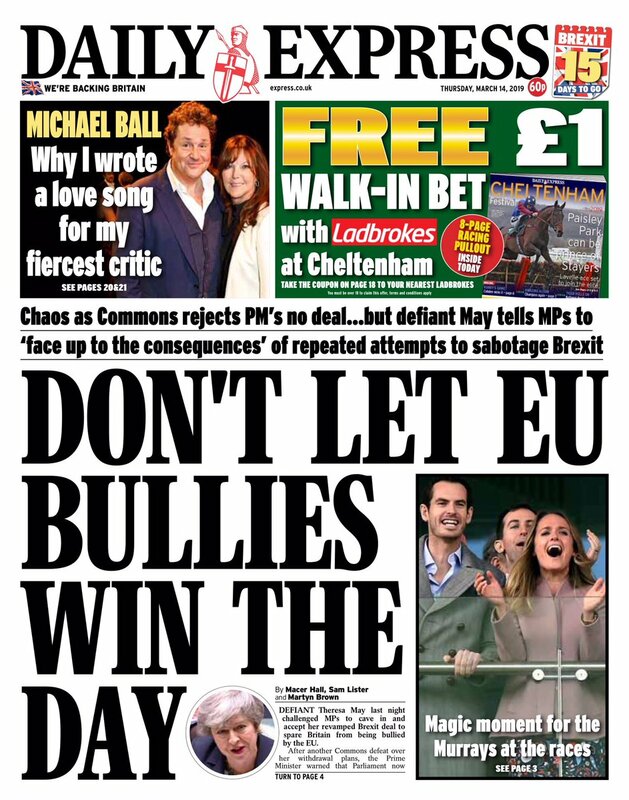 ?t let EU bullies win the day?? ?, saying: ?? ?Chaos as Commons rejects PM?? ?s no deal??? but defiant May tells MPs to ?? ?face up to the consequences??? of repeated attempts to sabotage Brexit???. The Sun features news of the defeats on its front page: ?? ?2 more years of Brexit?? ?, but the paper?? ?s lead story is about Madeleine McCann.